I am sooo sorry I haven't blogged in a week or so - I have been extremely busy with uni work as of late but I promise that there will be a corker of a post in the next few days because tomorrow I am going to Birmingham Christmas Market for an entire work-free Christmassy fun day out! I know it's only November, but me and my flatmate have been stressed to the max lately and just fancied a nice little day out! I decided to write this post when I was looking through photos from my holiday to New York from September 2013. I've mentioned on here before that I'm on a mission to lose weight and get fitter, and I couldn't quite believe the change that has happened! I know one year is a long time and people probably do this in half the time, but for me this was such an achievement! I am an absolute foodie and it has been a real struggle changing my eating habits, eating out less, and taking up running because I am no natural Mo Farah I can tell you that now! I believe we all come in different shapes and sizes, and we are all the perfect versions of ourselves. But that photo on the left just wasn't me. I didn't feel comfortable, confident and I had given up on so many things that were once important to me, including dance. It got me to thinking about how much I have changed within one year and how incredibly happy I am. On a daily basis I forget how fortunate I am and how proud I should be of all the positive changes I have made. This time last year, I was unhappy in so many ways. With my living arrangements at university, with my appearance, with how I was treating members of my family when I was feeling stressed, and how bad a friend I had been to some of my closest friends. I felt I was surrounded by some people (not all) who were not right for me and did not help me to be the best version of myself. I'm not trying to blame the way I became on anyone else at all. It was my fault. For allowing myself to become unhappy and to move within the circles of people that weren't right for me. I am now looking after myself far more. More days out, healthier food, making time for exercise. I (hope) I am being a better friend. I am reconnecting with people I lost along the way a few years ago, who make me happy and who I hope will be with me forever. I'm doing things I want to do for me, for the first time ever. I'm spending more time with my family, particularly my parents, Nan, brothers and their wives, and their children. I'm picking my nieces and nephews up from school, working with them, playing their crazy imaginary games for hours and hours, having my hair done by a four year old because she's a hairdresser today, but being a child in her class when she feels like being a teacher. I bought a car and found a new freedom. I grew my hair out again. So many little things that make me just feel like the person I'm supposed to be. I know this is going to be so cringey and embarrassing for some of you to read. But all I'm really trying to get across is that I think it is so important to take a look at your life, and ask yourself: Are you happy? Or are you just comfortable? A year ago, I was just comfortable.Not comfortable in the sense that you enjoy how life is going. I was just doing things on a daily basis 'to get me through'. I didn't ask myself if what I was doing was right for me or making me happy. Instead I was just doing what I thought was expected of me, or doing what I thought would make others happy. But when someone asked me this very question, I didn't know what to reply. No I wasn't happy. I WANTED to get back in touch with people. I WANTED to remove certain individuals from my life. I WANTED to be the best auntie in the entire world. I WANTED to be able to jog, and do yoga, and go swimming, and dance. I WANTED to have movie days with my Mum like we used to. I WANTED to be confident enough to talk in class and not feel like everyone is judging my accent or my appearance or my comments. Take a step back, and ask yourself the same question. Ask yourself if there are any changes you think should be made to make you the best version you can possibly be. It can involve a lot of hard work if the list is crazy long like mine was. But when you get a year down the line, maybe even only a few months down the line, you'll look back and be so proud of yourself for making so many positive changes. The best part about my transformation for me, was when my Mum looked at me and said "I think the old Shannon is back". 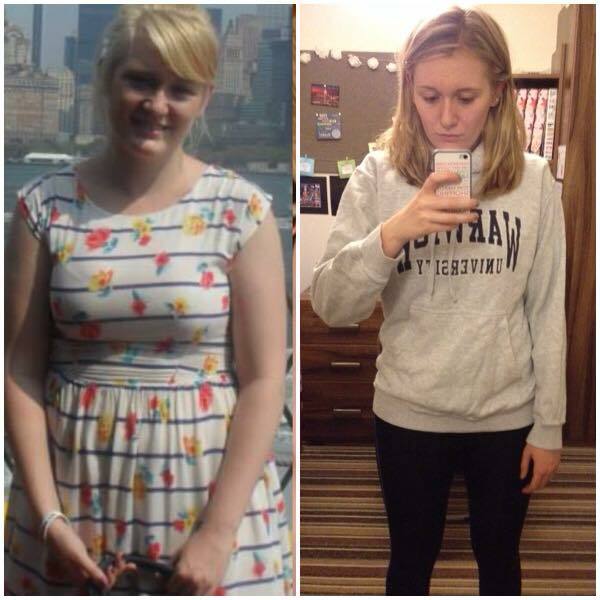 Lovely post, you look amazing and all the efforts you're making are really worth it! Congratulation, you deserve to be as happy as possible!